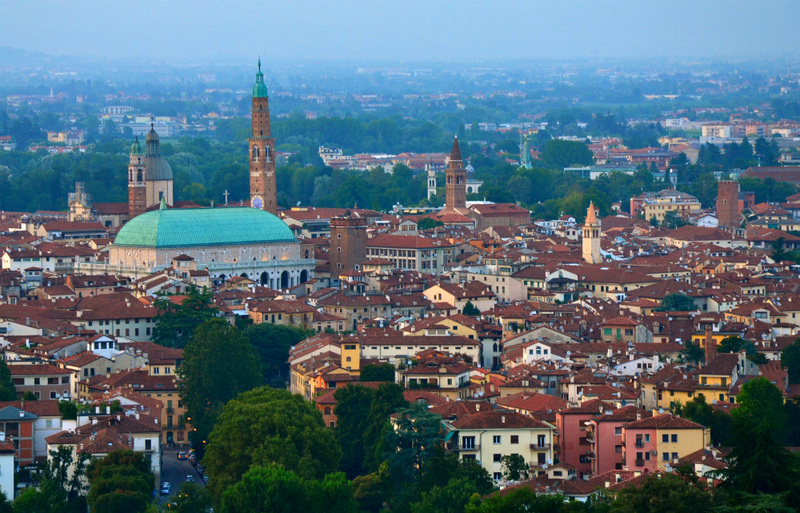 Vicenza is a small metropolis, has 113.000 inhabitants and is the main center of the province of the same name. 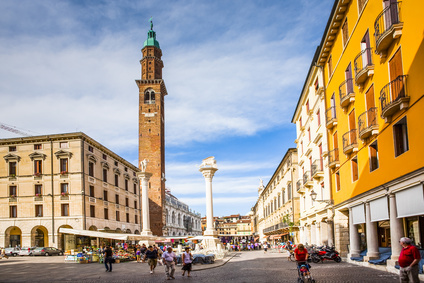 Vicenza combines the cultural offer of urban life to the tranquility of a people-friendly city, with shops and typical cafes in every corner and square. Vicenza is a lively city, teeming with events throughout the year: the march “StraVicenza” in March, the cycling tour “Marathon” in April, the Bible and the Jazz festival in May, the music festival in summer, Festa Ambiente, the Environment Celebration, in June, the musical revue at the Olympic Theatre in June, the Feast of the Patron on September 8, Vicenzaoro, one of the world’s largest jewellery events, in January, May and September. Vicenza is a historic city: from 49 BC the city was under the Roman Empire, in 1404 came under the rule of the Republic of Venice, after the Congress of Vienna in 1815 became Habsburg rule and after the third war of independence was annexed to the Kingdom of Italy. Of the bombings suffered by the city during the two world wars no traces remain. 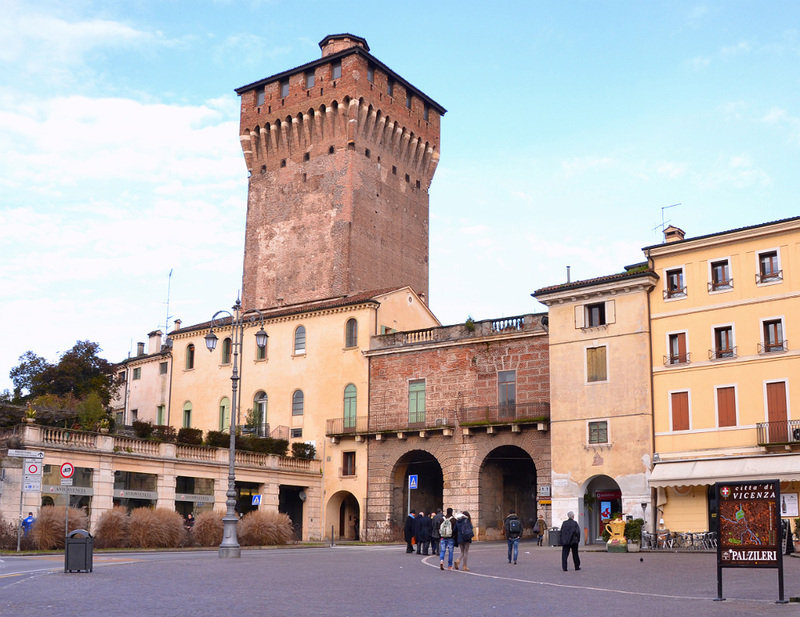 Vicenza is economically dynamic, with over 92,000 companies in the city and province.Vicenza is economically dynamic, with over 92,000 companies in the city and province. Plant construction, machinery manufacturing, tannery, jewelry, electrical and electronics, clothing and textiles, furniture and ceramics are among the most important productive sectors that make Vicenza one of the main areas of Italy for export volume. 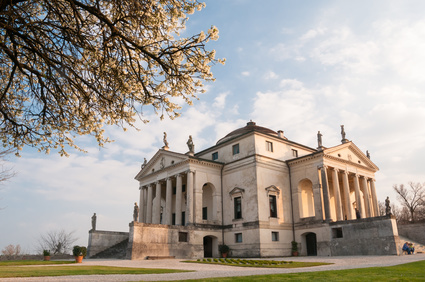 Vicenza is a city with many places of historical and artistic interest: churches and streets of the Roman era, architectural works of the great architect Andrea Palladio as the Teatro Olimpico, Villa Rotonda or the Basilica, Renaissance squares and art galleries. Vicenza is part of the UNESCO World Heritage since 1994. Vicenza counts among his fellow citizens names from the world of industry, research and sport including Renzo Rosso (founder and owner of Diesel), Lino Dainese (founder and president of Dainese, specialized in producing motorcycle clothing), Tullio Campagnolo (Campagnolo founder, specialized in the production of bicycle components), Federico Faggin (inventor of the microchip), Paolo Rossi (footballer world champion), Roberto Baggio (footballer) and Gelindo Bordin (Olympic marathon gold medal). 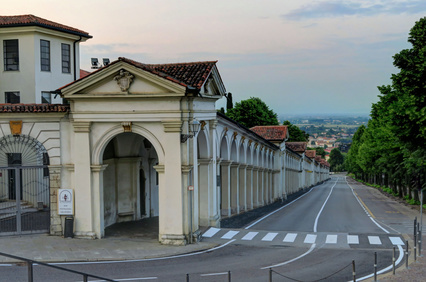 Vicenza is famous for its excellent road connections: in 15minute drive you can cross the city from end to end, there are bike paths everywhere and the bus takes at most 30 minutes from the suburbs to the center of the city, serving up midnight. Vicenza is in a central location and has a network of public transport at affordable prices: by train you get to Vicenza is in a central location and has a network of public transport at affordable prices: by train you get to Verona in 30 minutes, to Venice in 45 minutes. Verona in 30 minutes, to Venice in 45 minutes, by car in two hours you are in Milan and the airports of Verona, Venice, Milan-Bergamo or Milan-Linate are all reachable in a short period of time ranging from one to two and a half hours. Vicenza is an international city: 15% of the population come from all over the world. Among the many Europeans living in Vicenza, have found their second home people from the United States, Morocco, Serbia, China, India, Bangladesh, Ghana, Senegal, Ivory Coast. Vicenza is an open and welcoming city: voluntary work is quite common among. Vicenza is a safe city, with a very low crime rate. The people of Vicenza who are curious and enjoy traveling to learn new languages and know new cultures. Thanks to their innate cordiality, make friends with the people of Vicenza is very easy. Vicenza is a safe city, with a very low crime rate. In many moments of the year the life of the inhabitants takes place mainly outdoors and in this city you can not feel alone! 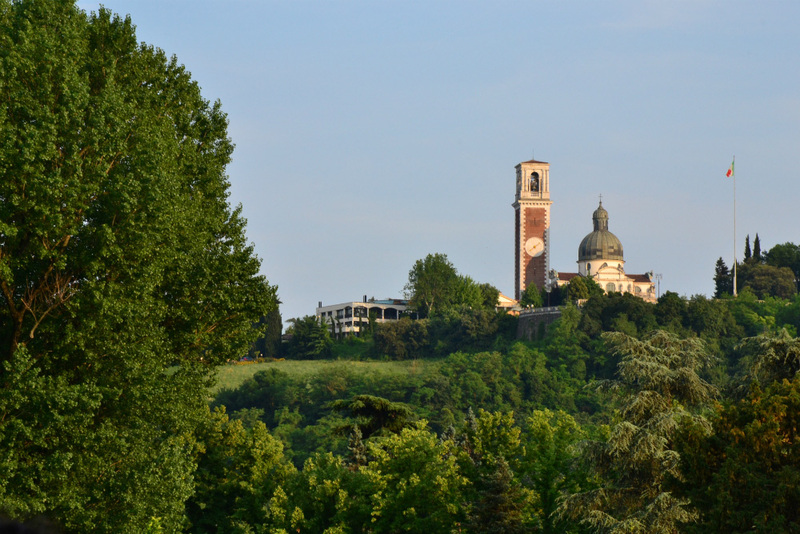 Vicenza is a city that offers many opportunities for education and training, thanks to the many institutions that are based here: state university, private university of management, professional and technical institutes of different scope including tourism, construction and handicraft. Vicenza also offers a wide variety of typical culinary delicacies: Vicenza style cod, bigoli with duck ragout, “soppressa” and other cured meats, cheeses – including the traditional Asiago, polenta, white asparagus of Bassano, truffles of the Berici Hills, Marostica cherries, grappas and wines of Breganze. 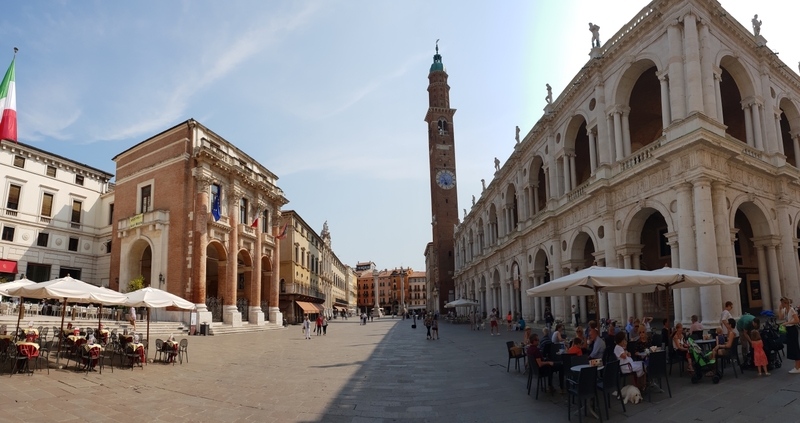 Vicenza is a small metropolis that combines the cultural offer of urban life to the tranquility of a people-friendly city, with shops and typical cafes in every corner and square.